The ‘A’ round-robin standings with two games remaining. The Ripley Wolves will be moving onto the ‘A’ semi-finals after a convincing 7-3 win over Milverton on Saturday night. Kurt Edwards was busy in the Wolves net, stopping 31 of 34 shots in the win. Goals were scored by Jordan Turcotte, Travis Vangaver (2), Jeremy McQuillin (2), Drew Davidson and David Jones. Assists went to Britton (2), Brett Catto (3), Nick Locking (2), Mark Stanley, McQuillin, Davidson and Vangaver. The Wolves wrap up the ‘A’ playoff round-robin when they host Lucknow on Sunday, March 1, at 3:30 p.m., in a game that could determine whether Lucknow slips into the Top 4. The Wolves will face Milverton in the semi-finals. Nick Locking had another big night for the Ripley Wolves. The veteran sniper scored four goals, including one 18 seconds into the first period, to lead the Wolves to a 7-3 win over Shelburne, in the third game of the five-game ‘A’ playoff round robin. The Wolves, now 2-1, can secure a spot in the semi-finals with a win tonight over Milverton (8 p.m., in Ripley). Joining Locking in the scoring was Mark Stanley, Drew Davidson and Brett Catto. Assists went to Travis Vangaver (3), Jeremy McQuillin, Tim Dwinnell, Jordan Turcotte, Paul Stewart, Alex MacLeod, Cody Britton, Davidson, Jordan Cale and Brian Stanley. Kurt Edwards was solid in the Wolves net, facing 23 shots for the win. Ripley hosts Milverton on Saturday night in Game 4 of the round robin. A win would assuredly secure the Wolves a spot in the semi-finals. They wrap up the round robin on Sunday, March 1, in Ripley, against rival Lucknow at 3:30 p.m. The Wolves played their second overtime game of the ‘A’ round-robin playoffs, and lost a wild one 8-7 to Huron East. Goals were scored by Nick Locking (3), Travis Vangaver, Jarred Colling, Cody Britton and Shawn Stewart. Assists went to Colling, Tyler McCarthy, Drew Davidson (2), Jeremy McQuillin, Stewart and Jordan Turcotte. Ripley’s game against Lucknow was cancelled on Saturday night due to weather and will be played in Ripley on Sunday, March 1, at 3:30 p.m.
Ripley will host Shelburne on Friday night, at 8:30 p.m., and then Milverton comes to town on Saturday for an 8 p.m. start. Due to road closures and stormy weather, the Wolves playoff game vs the Lucknow Lancers on Saturday, Feb. 14, has been cancelled. Watch http://www.ripleywolves.com for information about when the game will be played. The Wolves will travel to Seaforth on Sunday for an 8 p.m. start, weather permitting. The Ripley Wolves defeated Shallow Lake 5-4 in overtime in the opener of the ‘A’ playoff round-robin. The Wolves host Lucknow on Saturday, Feb. 14, at 8 p.m., and then travel to Seaforth on Sunday night at 8 p.m. The Ripley Wolves wrapped up their regular season on the weekend by playing spoiler, ending Saugeen Shores’ pursuit of first place in the North Division with a 4-2 win at home. 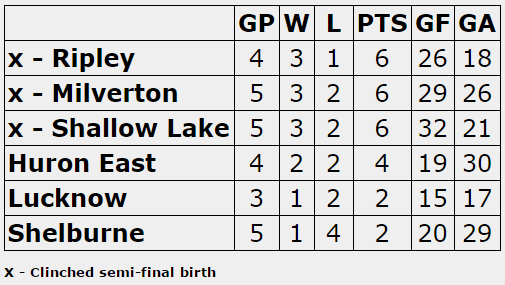 The win, which came on the heels of a wild 10-7 loss in Elora on Friday night, left the Wolves in sixth place overall, and the second seed in the ‘A’ playoffs, which will be a round-robin between Shallow Lake, Ripley, Lucknow, Shelburne, and Milverton and Seaforth from the South Division. The top four teams in the round-robin will meet in the ‘A’ semi-finals. The Wolves begin the round-robin in Shallow Lake, the top seed in the ‘A’, which tied the Wolves in points in the regular season but held the tie-breaker. The game is Saturday night at 8:30 p.m.
Feb. 14 vs Lucknow – 8 p.m.
Feb. 15 at Seaforth – 8 p.m.
Feb. 20 vs Shelburne – 8:30 p.m.
Feb. 21 vs Milverton – 8 p.m. Scoring in the game on Sunday vs Saugeen Shores was Tim Dwinnell, Brett Catto, Ryan Armstrong and Nick Locking. Assists went to Travis Vangaver (2), Cody Britton, Tyler McCarthy, Paul Stewart, Devin Kemp and Locking. Kurt Edwards was great in the Ripley net, stopping 35 shots for the win. On Friday in Elora, goal scorers were Brian Stanley, Jordan Cale, Britton, Catto, Vangaver, Locking and Armstrong. Assists went to Jeremy McQuillin (3), McCarthy (2), Britton (2), Locking and Vangaver. Edwards took the loss in the game.